Concours of Elegance 2017 will feature eight incredible and rare Ferraris in the Main Concours from throughout the brand’s 70-year history. Kicking off with the 1952 Ferrari 342 America Coupé Pininfarina and ending with the Ferrari LaFerrari Aperta, it’s a real celebration of one of motoring’s most famous icons. The 342 America was one of Ferrari’s first models, and one of its most exclusive, with just six built. Even rarer still, this Pininfarina Coupé variant was one of three. One of the earliest examples of the partnership between Pininfarina and Ferrari, this 342 is also one of the early ancestors of Ferrari’s two-seater GT lineage, which continues to this day. Closely related to the 342, and also coming to Hampton Court Palace in September, is the 375 America Pininfarina. Introduced with a new 300hp 4.5-litre V12 engine, it was another expensive and exclusive model, with just 10 examples built. One Ferrari in attendance with a particularly interesting history is a Ferrari 250MM once raced on the Carrera Panamericana. The man at the wheel was Mexican, Efrain Ruiz Echeverria, tackling the Panamericana in 1953 among a world-class grid of drivers and cars. Phil Hill was there in a Ferrari and Fangio in a Lancia, along with Taruffi and Castelotti, so Echeverria certainly had a challenge ahead of him. Nevertheless, Echeverria finished the race in seventh as the top privateer – an incredible achievement. 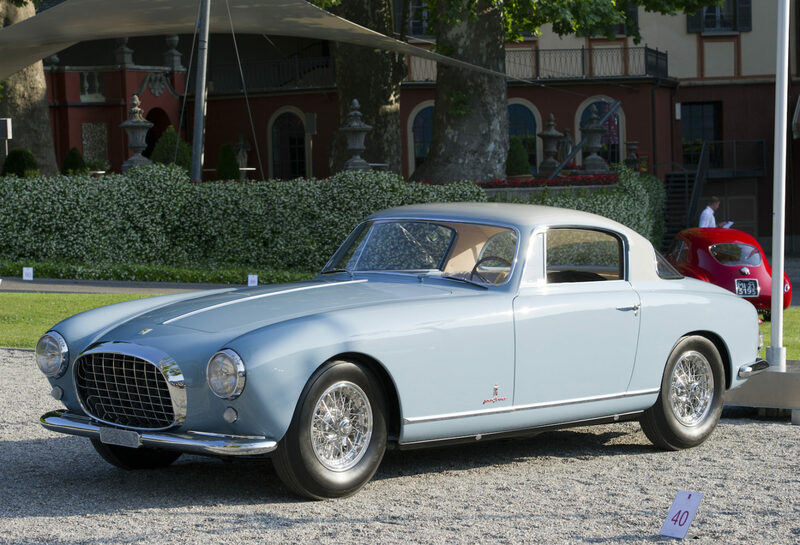 From 1953, the Concours will be hosting the Ferrari 340MM Vignale Spyder. Conceived to win the ’53 Mille Miglia, this particular model was extensively raced in period, including a fourth-place finish at Silverstone and a victory at the Sowega National Sports Car races. The 250 GT SWB Competizione coming to Hampton Court Palace represents the end of an era for Ferrari, as the last car that anyone could buy that could be raced successfully – without serious modification – and driven home again. As an example, 250 GT SWBs finished first, second and third racing at Le Mans in period. The exact car coming to Hampton Court Palace had a successful career of its own, finishing third overall at Spa and first in class at the Tourist Trophy. Also members of the 250 family, Concours of Elegance will be welcoming the 250 LM Scaglietti and GT SWB California Spyder. The LM Scaglietti boasted a number of racing successes in period, including an overall win at the 12 Hours of Reims in 1964. Likewise, the California Spyder had a fairly impressive racing history, including a fifth place finish overall at the Le Mans 24 Hours. Into the late ’60s and the Ferrari 330GTS, which marked a bit of a change for Ferrari – a little less racing car and a bit more road car, designed to be more comfortable and easier to drive. Only around 100 GTS convertible models were produced. Representing the very latest of the Ferrari model line-up is the Ferrari LaFerrari Aperta. The open-top version of Ferrari’s latest flagship model, pairs a 6.0-litre V12 engine with an electric KERS system to produce almost 1000hp.